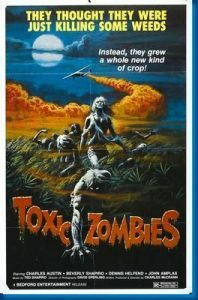 Released as “Forest of Fear” in the U.K , this little known gem has an undeserved bad reputation. Our action starts with a group of hippies farming our friend “the killer weed” high up in the hills. The Feds are aware of the activities and employ the local crop duster (an alcoholic misogynist (a nice combination)) to go and spray a payload of weed killer on the fields. This is no ordinary weedo thou , its an untested souped up DDT varient that they unleash on the unsuspecting hippies. The crop is sprayed , the hippies run , covered in the dust and vomiting blood , the crop duster stoned on cheap booze gets out of his plane , covered in the dust. And pretty soon the dusters fat wife falls victim , a family in the mountains on a trip and the evil (and now bloodthirsty (as blood is the only thing that can quench their devilish thirst) hippies run amok !